TOP CHEF TIPS FOR PANTRY MUST HAVES! 7 DIET TIPS YOU WANT TO FORGET! YES YOU CAN HAVE THAT SLICE OF BREAD! OUR FAVORITE APPLE RECIPES FOR FALL! GOOD EATS!…ADD A LITTLE ROMANCE TO YOUR DINNER MENU! HOW TO MAKE THE ULTIMATE CHOCOLATE CHIP COOKIE! EMERGENCY PREPAREDNESS! ARE YOU READY FOR STORM SEASON? IMG border="0" alt="Boston Proper, Inc." src="https://ad.linksynergy.com/fs-bin/show?id=uzQyp5TQeGQ&bids=434869.10002277⊂id=0&type=4&gridnum=0"
ARCHIVE: GRILLING RECIPES and TIPS! ARCHIVE: COMFORT FOODS TO WARM YOU ON THOSE COLD WINTER DAYS! ARCHIVE: DRINKING AND DRIVING…A DEADLY COMBINATION! ARCHIVE: OUR FAVORITE CHRISTMAS COOKIES 2017! ARCHIVE: St. Patrick’s Day Recipes! ARCHIVE: WHAT’S FOR DINNER…CELEBRATE THE NEW YEAR! ARCHIVES: ADD A LITTLE LUCK OF THE IRISH TO YOUR DINNER MENU! ARCHIVES: Can you FIX THE BUDGET? ARCHIVES: FEBRUARY IS…2016 Happy Valentine’s Day! ARCHIVES: November is…History of Thanksgiving Celebration…Stomach Cancer Awareness..
ARCHIVES: WHAT’S FOR DINNER…SPRING INTO EASTER! …Fish Taco’s for Lent?…Left over Easter Ham? ARCHIVES: WHAT’S FOR DINNER? Our Favorite Thanksgiving Recipes! ARCHIVES: WHAT’S FOR DINNER?…HOW ABOUT ROMANTIC DINING ALFRESCO! ARCHIVES: WHAT’S FOR DINNER? It’s Christmas Cookie time! FASHION ARCHIVE–SUNGLASSES FOR YOUR SHAPE FACE! 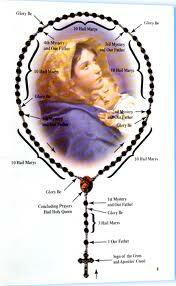 HOW TO PRAY THE ROSARY! OUR FAVORITE SUMMER STRAWBERRY RECIPES! PERSONAL STYLN SPECIAL EDITION 2018…Winning Style! SUMMERTIME RECIPES HOT OFF THE GRILL! WHAT’S FOR DINNER?…GREAT FALL RECIPES…including Thanksgiving! Eugene Bordon on Welcome to…COFFEEBREAKWITHFRIENDS WINTER issue! czesci ciagniki rolnicze on MENS FITNESS!…Get BIG ARMS Fast! enhancedonlinenews.com on MENS FITNESS!…Get BIG ARMS Fast! Essential driver training on MENS FITNESS!…Get BIG ARMS Fast! mobile games on MENS FITNESS!…Get BIG ARMS Fast! God has allowed Our Lady to appear for three decades. 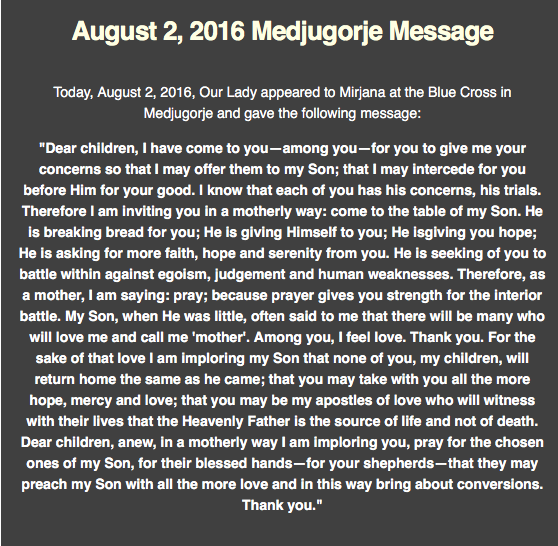 Go to http://www.medjugorjelive.org and click on the webcam! The Feast of the Rosary has a bit of an evolving history! The natural progression of Our Lady’s feast is a wonderful proof of her love and protection of her children that she so loves. Dates and details can be so boring, so bear with me through this, because there are many important dates and events that mark the way to the Feast of the Holy Rosary being established. Our Lady to St. Dominic . 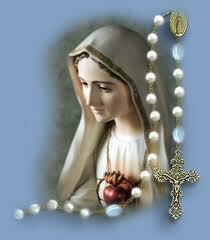 at this time, though the devotion to the Rosary was being spread very rapidly. Festival of the Rosary at that time. For that year’s festival, Pope St Pius V, who before he was elected to the Papacy, was also himself a Dominican Friar and loved the Rosary, had asked all the faithful to pray their Rosaries for the intention of success of the Holy League in defeating the Ottoman Regime. Next, Pope Gregory XIII, in 1573, set the Festival of the Rosary as the First Sunday in October, to be celebrated in those churches with an altar or Chapel of the Rosary. was extended to Spain and all her dominions. Then, Pope Clement XI, after the defeat of the Turks in 1715 in Belgrade, ordered the Feast to be celebrated by the whole church. In 1887, Pope St Pius X returned the Feast of the Holy Rosary to October 7th. Copyright © 2010, Mary’s Touch By Mail. All rights reserved. 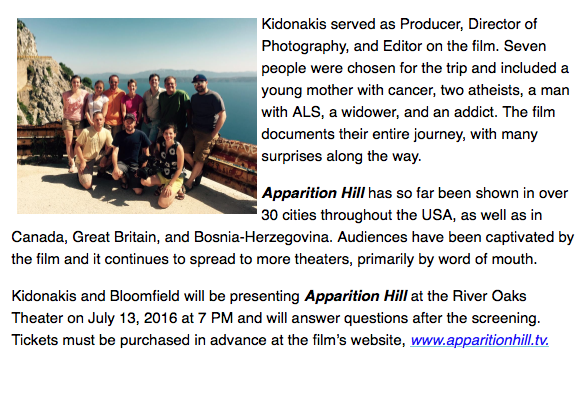 This summer, a group of people will visit Medjugorje, the site of alleged miracles in Bosnia-Herzegovina, and their experience will be filmed. 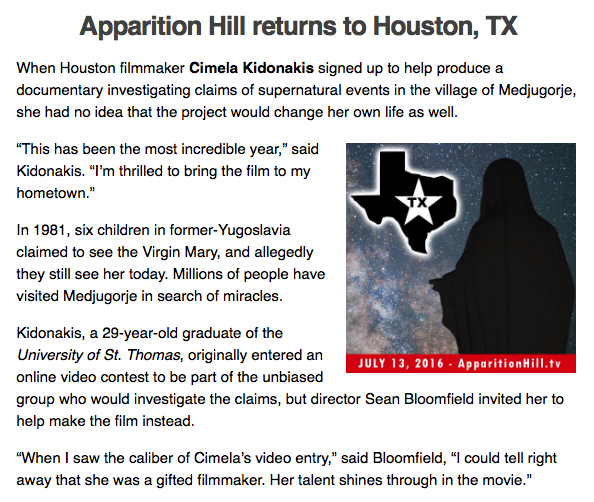 Visit www.apparitionhill.tv to learn more. 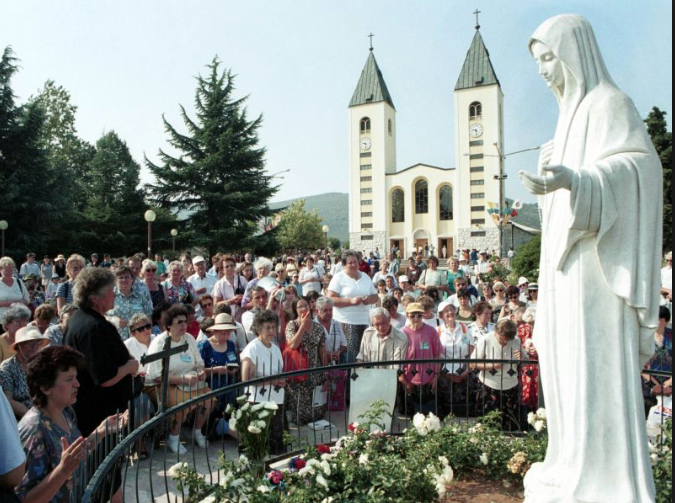 in Medjugorje. This video features exclusive footage of an apparition. 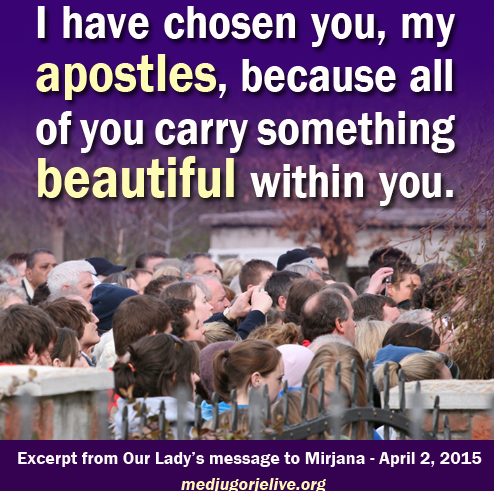 It has been beautiful days in Medjugorje, celebrating the feast of All Saints and the Holy Souls. 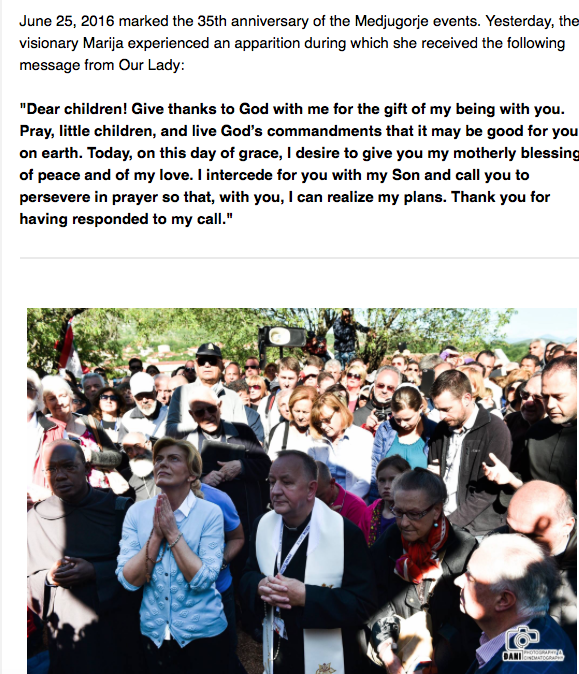 Blue skies, sunny days, and mild temperatures during the day have kept pilgrims on the mountains and walking through the vineyards to soak up the grace of Our Lady’s presence. 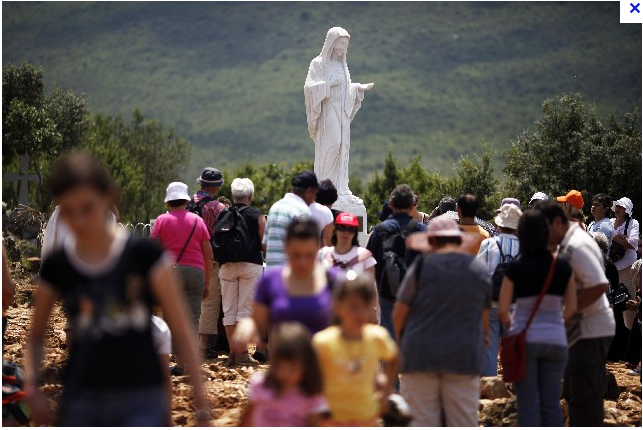 November typically brings to end the pilgrimage season each year for many people in the village and those who bring groups from around the world, though Medjugorje is never without pilgrims all together. For the villagers it’s a time of rest and a time for family as many of the shops and pansions close for the winter months in Medjugorje, bringing a slower pace of life. 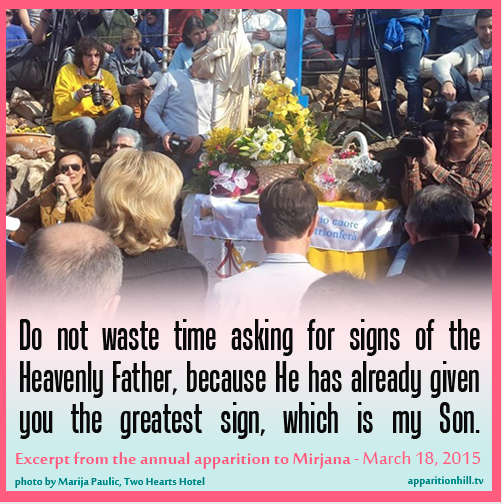 However, Mirjana’s apparitions continue to be heavily attended, even in the colder months and today was no different. 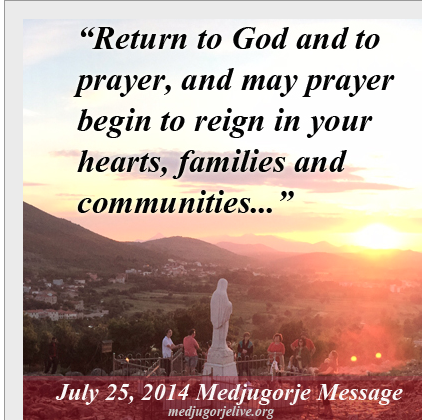 A great many buses rolled into Medjugorje just two days ago bringing thousands of pilgrims who desired to be in Our Lady’s presence on the second of the month, as well as many Croatians who visit Medjugorje each year for the Feast of All Saints and All Souls. Though the temperatures during the day have continued to be pleasant, recently the mornings and evenings have turned very chilly. Yet, the cold did not stop some pilgrims from keeping their prayer vigil by the Blue Cross all night long. The pilgrims of Caritas of Birmingham’s November pilgrimage were by far the largest group with 30 of our 60 pilgrims spending the whole night at the Blue Cross for Our Lady’s apparition. All through the night other pilgrims arrived finding a rock to sit upon or a tree or rock wall to lean against. Discomforts seemed not to hinder anyone, as the willing spirits of those gathered, motivated by their love for Our Lady, were stronger than the temptations of the flesh. The stars, of which Our Lady mentioned in Her September 25, 2014 message, shown brightly against the night sky lighting the way for thousands who began walking to the Blue Cross before the dawn’s light began to slowly rise and just afterwards. 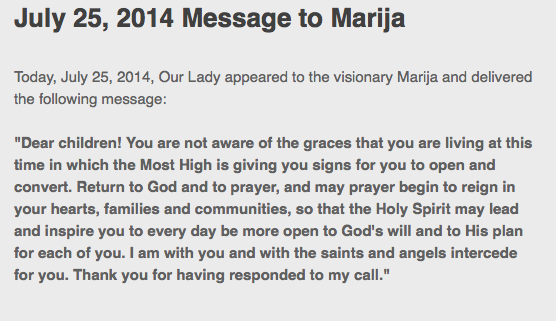 Our Lady appeared to the visionary Marija and gave the regular monthly message to the world. 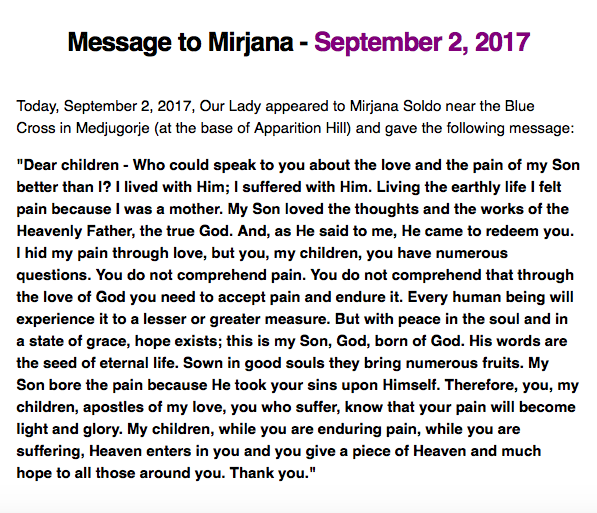 According to Mirjana, at first Our Lady was sad and then she was decisive. 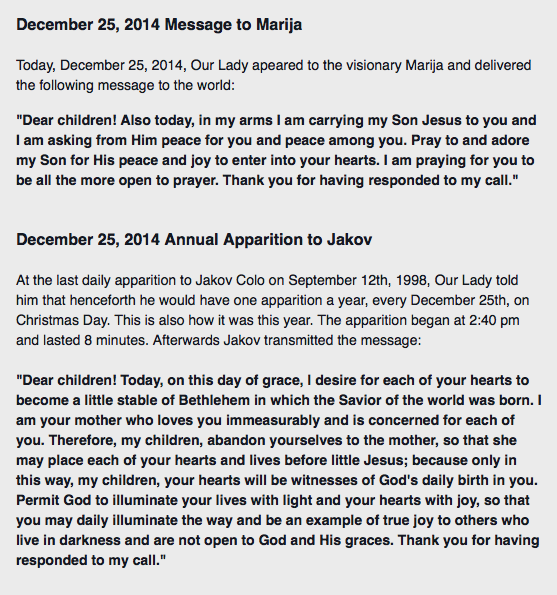 Our Lady appeared to the visionary Jakov for his regular yearly apparition. 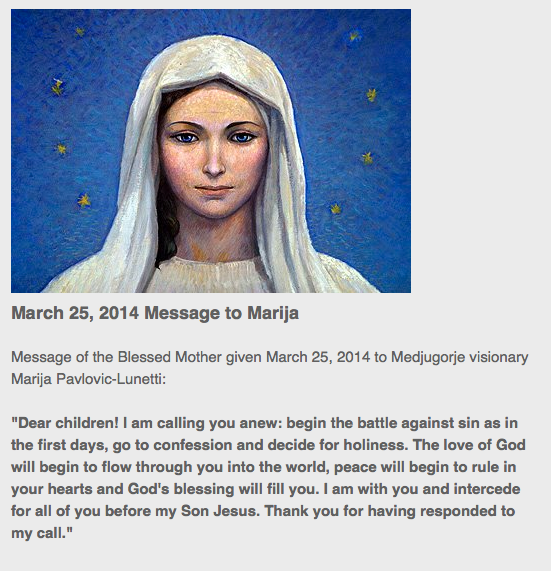 Today, April 25, 2013, the Blessed Mother appeared to the visionary Marija and delivered the following message: “Dear children! Pray, pray, keep praying until your heart opens in faith as a flower opens to the warm rays of the sun. This is a time of grace which God gives you through my presence but you are far from my heart, therefore, I call you to personal conversion and to family prayer. May Sacred Scripture always be an incentive for you. I bless you all with my motherly blessing. 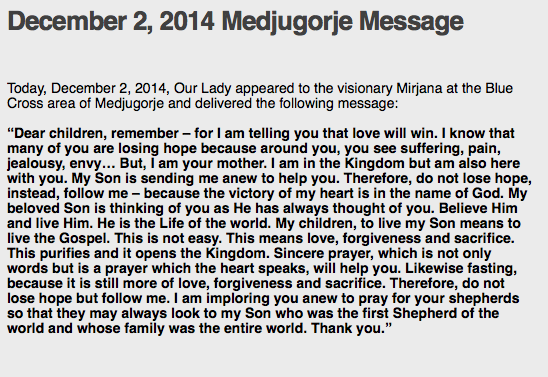 Thank you for having responded to my call.” To discuss this message with other believers, visit the Medjugorje Forum. Thank you and God bless! 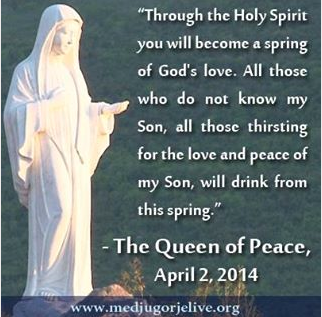 Sean Bloomfield Queen of Peace Productions *** Mirjana Soldo had her annual apparition today, March 18, at about 1:52 pm, Medjugorje time. 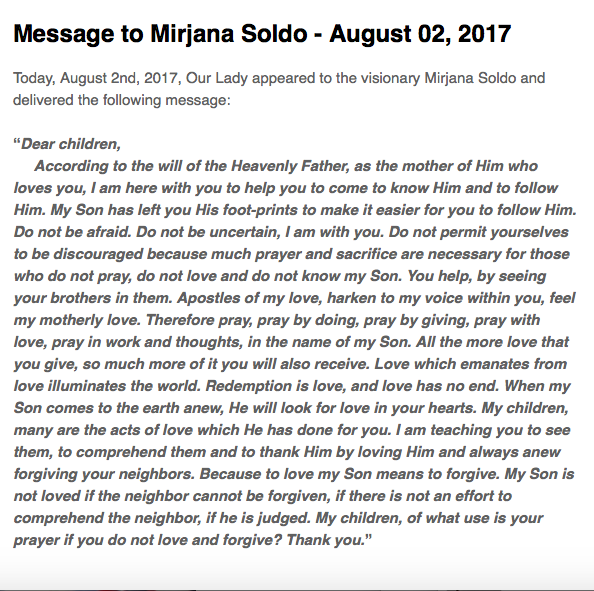 When Our Lady entrusted the tenth secret to Mirjana and stopped appearing to her every day, she promised to appear once a year, on March 18. 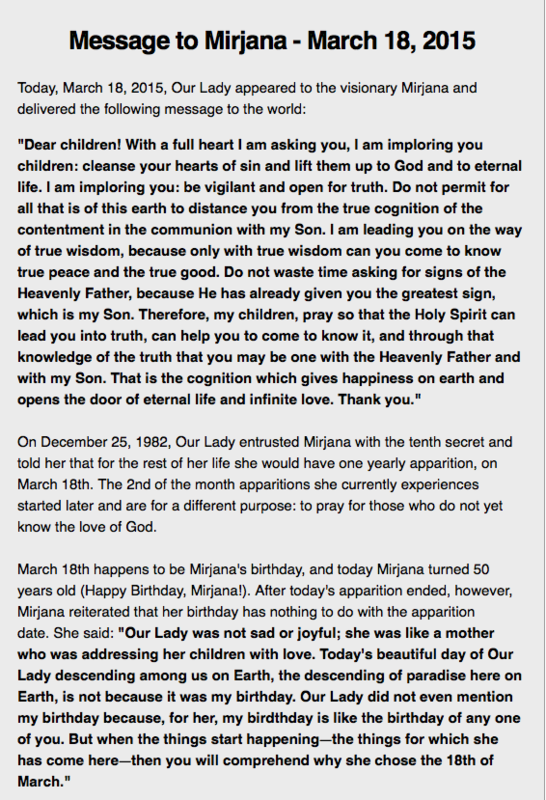 Although March 18 is Mirjana’s birthday, she claims that Our Lady chose that date for another reason, but, she said, we will only understand that reason in the future. 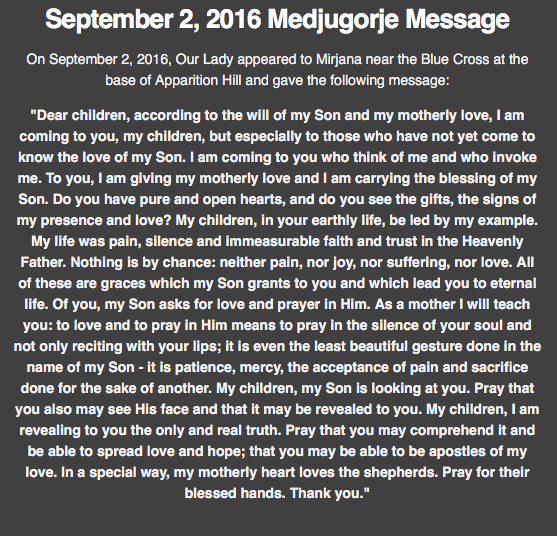 Due to rain, the apparition took place inside Mirjana’s home instead of near the Blue Cross area of Apparition Hill as it normally does. Interestingly, the message echoes the recent comments about God’s mercy from Pope Francis. 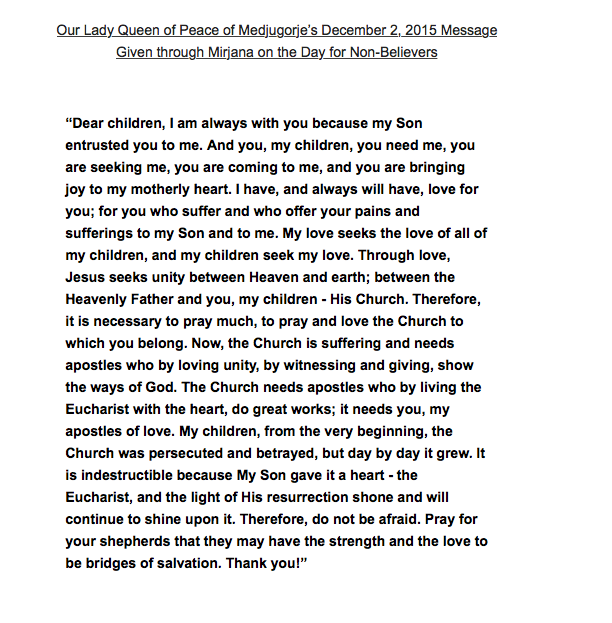 “Dear children! I call you to, with complete trust and joy, bless the name of the Lord and, day by day, to give Him thanks from the heart for His great love. My Son, through that love which He showed by the Cross, gave you the possibility to be forgiven for everything; so that you do not have to be ashamed or to hide, and out of fear not to open the door of your heart to my Son. To the contrary, my children, reconcile with the Heavenly Father so that you may be able to come to love yourselves as my Son loves you. When you come to love yourselves, you will also love others; in them you will see my Son and recognize the greatness of His love. Live in faith! Through me, my Son is preparing you for the works which He desires to do through you – works through which He desires to be glorified. Give Him thanks. Especially thank Him for the shepherds – for your intercessors in the reconciliation with the Heavenly Father. I am thanking you, my children. 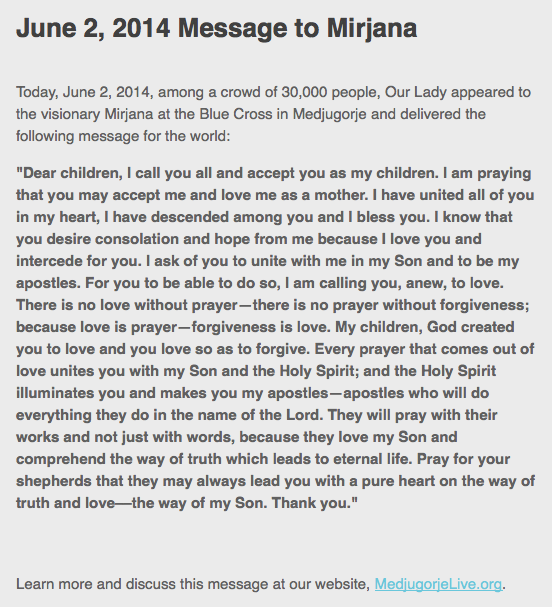 Thank you.” *Discuss this message at the Medjugorje Forum. 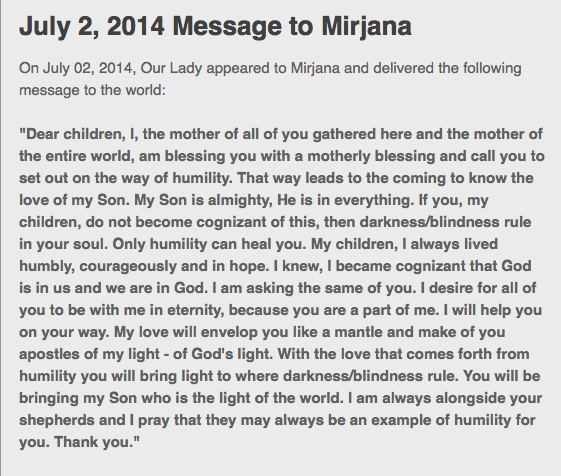 Today, March 2, 2013, Our Lady appeared to the visionary Mirjana and delivered the following message to the world: “Dear children; anew, in a motherly way, I am calling you not to be of a hard heart. Do not shut your eyes to the warnings which the Heavenly Father sends to you out of love. Do you love Him above all else? Do you repent for having often forgotten that the Heavenly Father, out of His great love, sent his Son to redeem us by the Cross? Do you repent for not yet having accepted the message? My children, do not resist the love of my Son. Do not resist hope and peace. Along with your prayer and fasting, by His cross, my Son will cast away the darkness that wants to surround you and come to rule over you. He will give you the strength for a new life. Living it according to my Son, you will be a blessing and a hope to all those sinners who wander in the darkness of sin. My children, keep vigil. I, as a mother, am keeping vigil with you. I am especially praying and watching over those whom my Son called to be light-bearers and carriers of hope for you – for your shepherds. 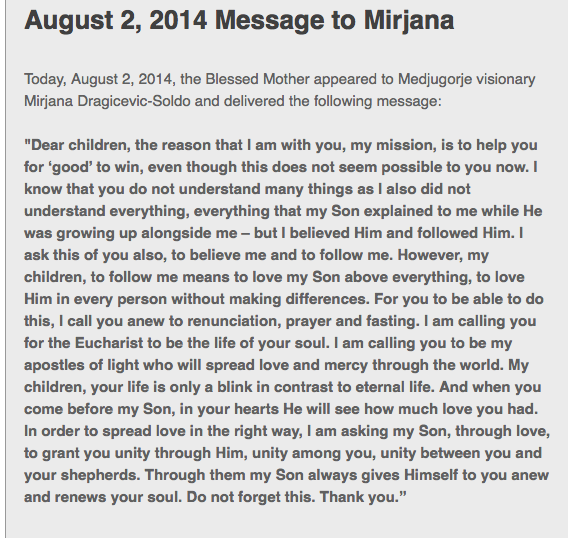 Thank you.” *Discuss this message at the Medjugorje Forum. “Dear children; Love is bringing me to you – the love which I desire to teach you also – real love; the love which my Son showed you when He died on the Cross out of love for you; the love which is always ready to forgive and to ask for forgiveness. How great is your love? 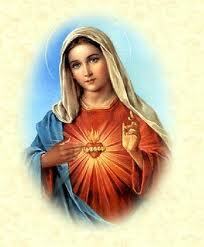 My motherly heart is sorrowful as it searches for love in your hearts. You are not ready to submit your will to God’s will out of love. You cannot help me to have those who have not come to know God’s love to come to know it, because you do not have real love. Consecrate your hearts to me and I will lead you. I will teach you to forgive, to love your enemies and to live according to my Son. Do not be afraid for yourselves. 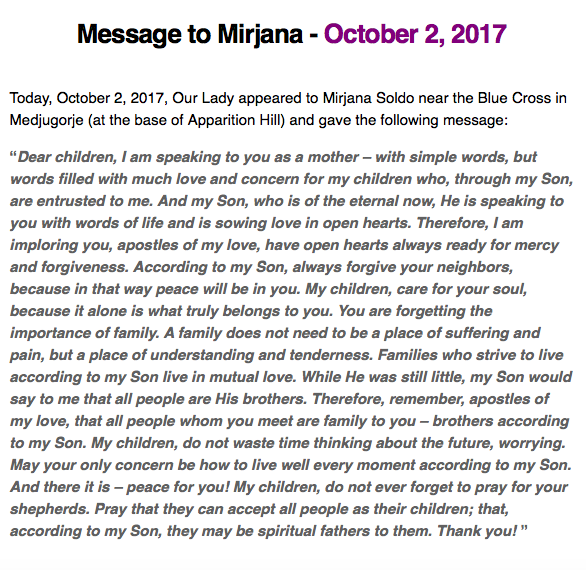 In afflictions my Son does not forget those who love. I will be beside you. I will implore the Heavenly Father for the light of eternal truth and love to illuminate you. Pray for your shepherds so that through your fasting and prayer they can lead you in love. 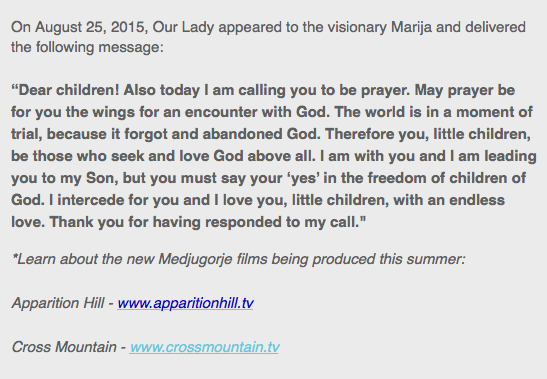 is the 31st anniversary of the Medjugorje apparitions! to your personal relationship with God the Father, to the joy of prayer in Him. God the Father is not far away from you and He is not unknown to you. He revealed Himself to you through my Son and gave you Life that is my Son. Therefore, my children, do not give in temptations that want to separate you from God the Father. Pray! Do not attempt to have families and societies without Him. Pray! Who is sincere goodness. Only hearts filled with goodness can comprehend and accept God the Father. that the Mother of God was with us? Each of us should ask himself: ‘Are you worthy of this?’. 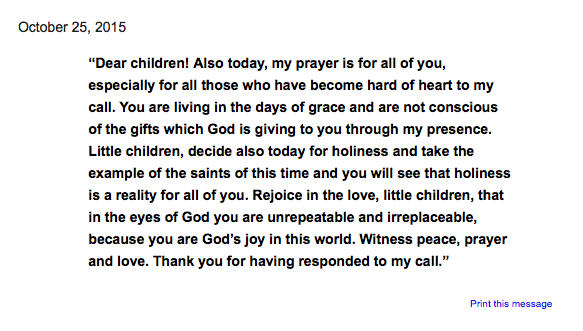 “Dear children! I call you, for this time to be for all of you, a time of witnessing. He is the only true God. I am with you and I will remain with you. 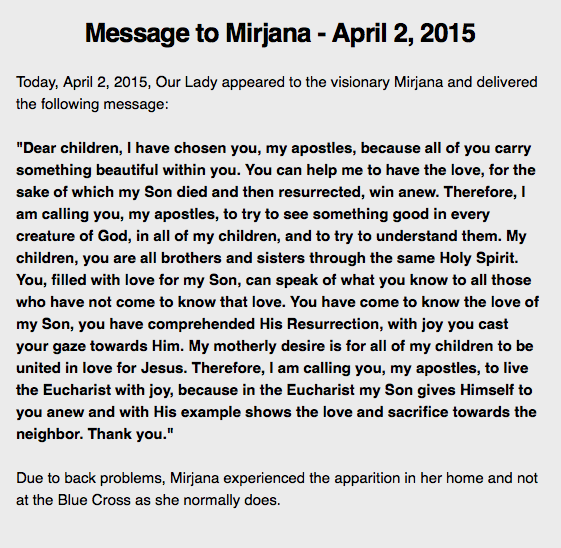 Our Lady appeared to the visionary Mirjana Soldo at the Blue Cross. 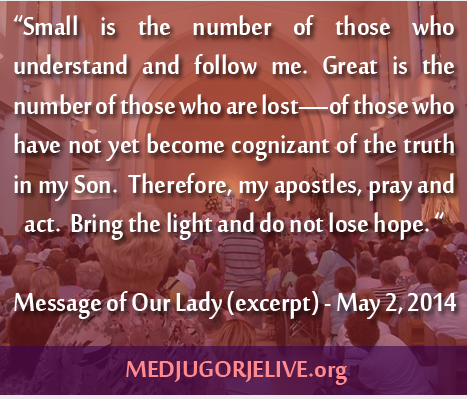 many of them young people who were in Medjugorje for the Youth Festival. a people who knows that, with God, despite all sufferings and trials, they are secure and saved. my children, you cannot stop the evil that wants to begin to rule in this world and to destroy it. But, according to God’s will, all together, with my Son, you can change everything and heal the world. 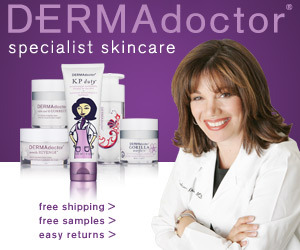 TOP BRANDS WITH AFFORDABLE PRICES!